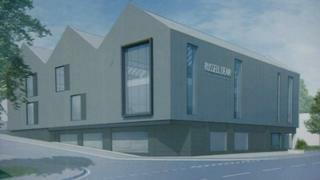 A flood-hit furniture store is to be rebuilt on stilts to make it more resilient after plans were passed by a council. Russell Dean in Mytholmroyd, West Yorkshire, is to stay but with the building lifted further off the ground. Mytholmroyd suffered severe flooding in December 2015 when the River Calder burst its banks on Boxing Day. It also flooded in 2012. Store owner Graham Schofield said: "We always wanted to rebuild here." The plans, agreed by Calderdale Council's planning committee on Tuesday, entail a partial demolition of the existing structure and construction of a three-storey retail building. The £3m works will begin in a few weeks and the new store is planned to open on Boxing Day, exactly two years after the floods hit the village. Mr Schofield said it was "not a straight economic decision... we are trying to put something back in the village". The shop has been on the site for 50 years when it was bought from the original owners. It is currently having a demolition sale. Mytholmroyd is at the confluence of the Calder River and a brook.